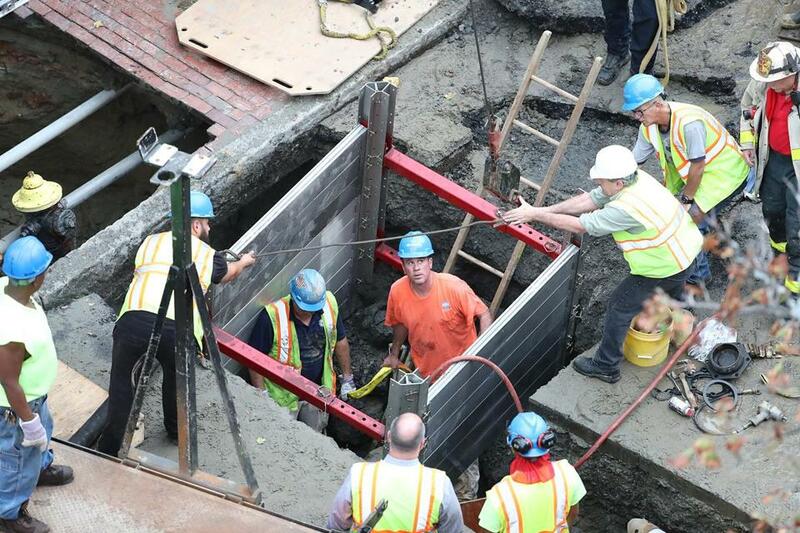 Boston Firefighters and emergency personal worked to rescue construction workers that were trapped in a trench. 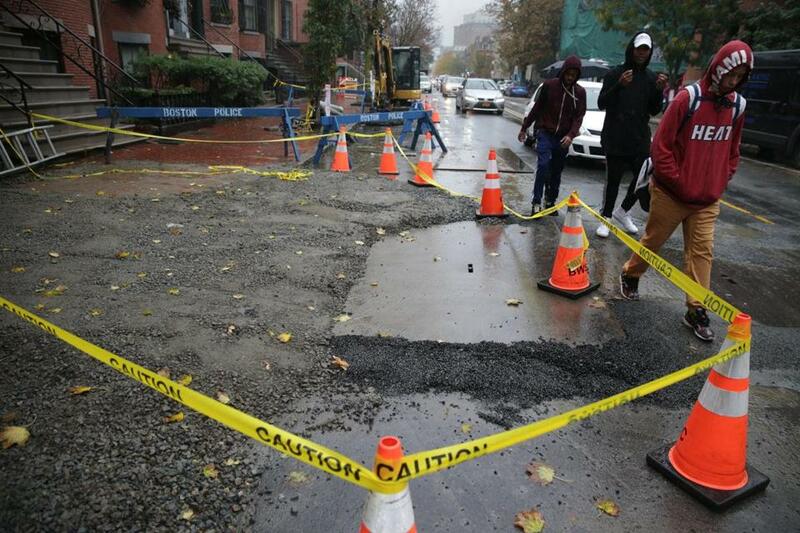 A Boston drain firm and its owner flouted safety regulations that could have saved two employees who died when a trench collapsed and filled with water in October, prosecutors said Wednesday. Then, the owner and company sought to cover up their inaction by forging documents to suggest they’d taken required safety classes, officials said. Now, Atlantic Drain Services and owner Kevin Otto each face two counts of manslaughter and other charges stemming from the incident’s aftermath, Suffolk District Attorney Daniel F. Conley said during an afternoon press conference. A grand jury handed up the indictments earlier in the day. 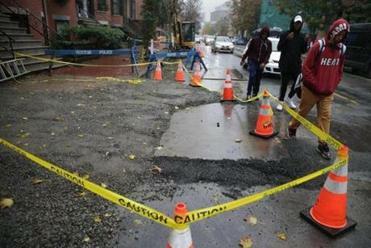 The announcement of charges against the troubled company included the first detailed description of what happened Oct. 21 deep beneath Dartmouth Street in Boston’s South End. Atlantic Drain is also the subject of an ongoing probe by the same federal agency that twice fined the company for earlier safety violations. Kelvin Mattocks, 53, and Robert Higgins, 47, were 14 feet underground when the earth began to give way, Conley said. Dirt and clay buried them up to the waist; high above their heads, a fire hydrant that had been supported by the collapsed dirt was suspended by its water supply line. The line broke, and water rushed in, filling the trench in seconds. Robert Higgins, 47, and Kelvin Mattocks, 53, died Friday. Despite the frantic efforts of coworkers, the men could not be saved — the water was too deep and flowing too fast, Conley said. Camille F. Sarrouf Jr., a lawyer for Otto and his company, declined comment Wednesday, because he had not had a chance to review the case materials. Otto, who will be arraigned in Suffolk Superior Court at a later date, could not be reached. The manslaughter charges against Atlantic Drain carry a maximum penalty of $1,000, and Conley urged lawmakers to raise the cap on corporate liability in such incidents. Otto faces maximum 20-year prison sentences for each manslaughter count. Mattocks’s sister, Melinda Mattocks-Ushry, welcomed the news of the indictments when reached by phone. Jerry Biancuzzo, Higgins’s stepfather, also praised prosecutors. The tragedy was entirely preventable, according to Conley. He said federal regulations require a trench as deep as the one on Dartmouth Street to be shored up using one of several methods. The trench where Mattocks and Higgins died had none. An expandable metal device known as a trench box was on site, but not in use. Conley said it wasn’t clear why the trench box or other shoring, such as wooden beams, hadn’t been used. “Whether it was greed, or haste, or indifference that led Kevin Otto and Atlantic Drain to forgo their responsibilities isn’t for us to say,” he said. A spokesman for the Occupational Safety and Health Administration said the agency’s investigation was ongoing. The scene at Dartmouth Street where a water main break flooded a trench and two workers were killed. A permit application shows the company was approved to dig two 5-foot-wide trenches, one 21 feet long and the other 36 feet long. The work included replacing sewer and water lines to the property, whose owners were undertaking major renovations. City permit records show it was among Atlantic’s largest jobs in recent years. At the time of the tragedy, Atlantic Drain and its owner were facing lawsuits, OSHA fines, tax liens, and complaints from neighbors aghast at the overpowering stench emanating from an Atlantic lot in Hyde Park. The company’s problems appeared to be showing in their work: The city’s Water and Sewer Commission later acknowledged the company had fallen so far behind on paperwork and inspections that it had put a hold on issuing Atlantic Drain new construction permits. In the wake of the collapse, Mayor Martin J. Walsh proposed rules that require companies to report whether they are in good standing with OSHA before they can receive work permits. Those rules were approved by the City Council in December. Conley said Wednesday that after Mattocks and Higgins were killed and local and federal investigations spun into action, Otto allegedly sought to deceive authorities by forging employees’ signatures to make it appear they had completed trench safety courses — courses required because of the company’s earlier OSHA violations. Otto and the company face several additional charges for the alleged fabrications. The indictments are a “very important, bold step” in enforcing workplace safety laws, said Marcy Goldstein-Gelb of the National Council for Occupational Safety and Health. In the weeks after the collapse, Atlantic Drain’s history of safety problems came into sharp focus. The company had previously been cited for workers lacking oxygen underground and for conditions that could lead to cave-ins, federal records show. In addition, about $103,000 in prior OSHA fines relating to job site safety remain unpaid. And Otto, whose father founded Atlantic in 1978, was named in a $209,921.76 federal tax lien in August. On Wednesday, family members of the victims remained stunned that the company obtained permits for the fatal trench work, despite the firm’s myriad safety problems. 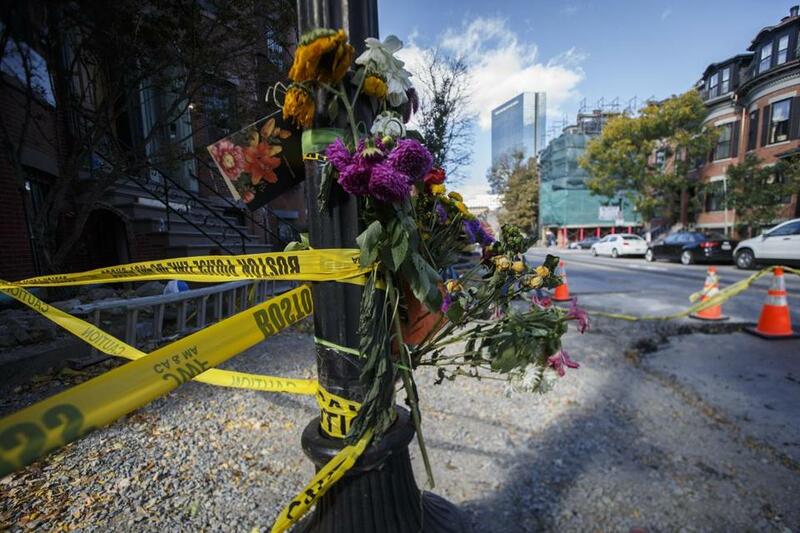 Flowers hung on a lamp post as a memorial for two construction workers killed at the scene where a water line burst on Dartmouth Street in Boston. Nestor Ramos can be reached at nestor.ramos@globe.com. Kay Lazar can be reached at kay.lazar@globe.com. Travis Andersen can be reached at travis.andersen@globe.com.